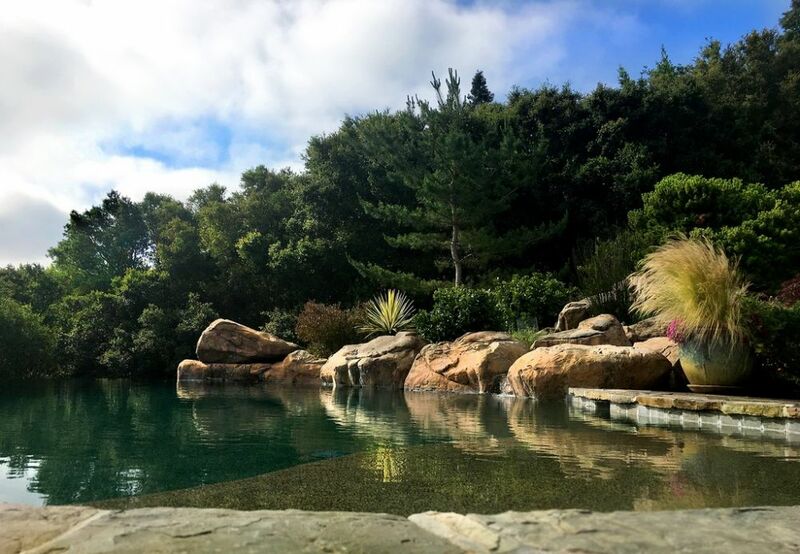 Called upon when other contractors couldn't give the client the organic look he wanted, Matt Wilson put his skills and long experience with artificial rock to the test in creating a water- and plant-draped outcropping that appears to have been in place since time immemorial. It was a great project: The client called us in to look at a sloping backyard for which his one and only wish was an environment that would be “organic and pre-existing” – that is, a composition that looked as though it had been there forever, long before the adjacent home entered the picture. That sort of look is our stock in trade at Outdoor Republic, a Pleasanton, Calif.-based firm that specializes in the use of artificial rock. As is often the case, we became involved after the homeowner had talked with several contractors who couldn’t see a way to achieve the look he wanted with real rock: Access was a problem, they knew, and the cranes usually deployed to deliver boulders would’ve had trouble placing any rocks of the desired size. The path the homeowner ultimately decided to take was a good bit costlier than the real-rock option, but he had something distinctive in mind – and we were just the folks to bring his vision to fruition. The yard that would become our canvas was relatively small and set on a hillside falling away from the home, which already occupied almost all of the lot’s easily usable area. Access was indeed limited, coming only via a steep, narrow driveway hemmed in by large trees the homeowner didn’t want to compromise in the construction process. It didn’t take much conversation to catch onto what he’d learned from the other contractors: that they couldn’t find a way around the access issues and that the “real rock” he’d been after just wouldn’t work. Helpfully, a couple of them knew of our expertise in just this sort of situation and pointed him in our direction. Faced with a reality in which he wouldn’t be able to have real rocks that were much bigger than a wheelbarrow, he wasn’t a terribly happy camper when he invited us over for a chat. But it wasn’t long before we convinced him that the artificial-rock alternative had real potential. At that point in my career, I’d already been building artificial-rock structures for more than 15 years and spoke with a voice of both experience and authority – and it didn’t hurt that I had a beautiful portfolio to share. He was convinced of our skills, but then the conversation turned to cost and he was taken aback by the fact that an artificial-rock solution would set him back a good bit more than real rock. I wasn’t privy to the details of the other contractors’ proposals, I said, but I let him know that if any of them could figure out a way to work with real rock on the same scale as my artificial rock for less money – and in a fashion that would look as good as my work in the context of the home and the setting – he should get back to one of them and send me on my way. As he pondered this and looked through my portfolio again, I talked about the fact that I’d been studying rock formations and outcroppings for 40 years and that I had a complete approach that I was confident would deliver the naturalistic results he wanted. Yes, I conceded, it would cost more, but given the strength of his own vision of how he wanted things to look, wouldn’t it be worth something extra? As a clincher, I let him know that what I proposed to do would look spectacular with the water flowing – and that it would be almost as awesome when dry. Ultimately, he saw the light and we were on our way. We will not build an artificial rockwork structure of any kind without first preparing a half-inch-scale model – and only when it is approved with a client’s signature will we actually begin any work on site. I always start by producing a base that matches the site’s contours, then I rough in clay shapes to begin the design process. I’ll share this rough model with the client: It’s an early, crucial opportunity to get feedback about sizes, shapes, angles and heights. By and large, there’s little to adjust, but it’s a reassuring step for the client just the same. Next, I’ll add detail to the model and generate something that gives my clients a very specific sense of what they can expect to find in the backyard when we’re done. Again, there are occasionally adjustments to be made at this point, but that’s rare. Once we have the required signature, I’ll harden the clay and add color so we can use the model on site as a construction guide. It will stay there for the duration of the project and will be used hourly in our crew’s reference checks. The project model is one of our most important tools: It convinced the client that we were on the right track, and, when fully colored after initial design approval, became an hourly quality-control mechanism as our crews compared what was emerging on site to what the client would ultimately be expecting. We see the model as such an important operational touchstone because the process of crafting and installing artificial rockwork can be extremely complex – particularly in a project such as this one where we would be working on a slope with large-scale components and hidden elements including compacted earthen tiers, sunken piers and meticulous grading for soil retention and drainage systems. We started working in this case with the rock waterfall system, the pool shell and the retaining structures; then came the cabana and landscape features once the major construction processes were fully under way. We always work on the artificial rock feature in tandem with the swimming pool when the rockwork meets the pool edge at any point, and the same applies to retaining walls. In both cases, we need to accommodate the load and surcharge imposed by the rockwork in designing and engineering the pool and retaining walls in accordance with prevailing soil conditions. Pier depths, wall thicknesses, steel schedules and a variety of other construction details come into play here. This additional load and surcharge to the pool shell and retaining walls can be dramatic: If our work is to last, we absolutely need to nail this part of the process. As mentioned above, we constantly refer back to the model as the installation process unfolds. It’s all about communication with the homeowner and among work crews and keeping everything (and everyone) on track. As we get deeper and deeper into our task, it’s always good to have a signature-sealed model on hand to protect ourselves – as builders of unique, custom-crafted rockwork and watershapes – in the event a client starts working off a different page from the one the rest of us are on. I’ve heard stories of other artificial-rock specialists who don’t prepare models and tell the client, “Trust me, I’m an artist and you’ll love it.” That trust occasionally breaks down, and I know this for a fact because I’ve been called upon by many homeowners who want me to remedy their bad situations, often with astronomical costs attached. That’s why, for us, the model drives the shapes and we do all we can to avoid more than incidental improvisation on the job site – and that’s true no matter whether we use castings or hand-carve everything ourselves. It’s all about expectations: We set them early and deliver as promised. In this project, the ‘rocks’ were made using molds from natural boulders, all wired together before being filled with concrete to ensure complete structural integrity. The recesses, jpints, planting pockets and lighting sleeves were all carved into the wet concrete. The scope and scale are indicated by the people seen in these images: This was a big formation. Of course, this places a huge responsibility in our laps to plan ahead with everything – every conceivable detail – at the time the model is made. Take hillside drainage as an example: With a project such as the one we’re discussing in this article, it’s absolutely essential to think through the ways stormwater and irrigation water will flow around, over and under our work. Our goal is to channel flows and help our rockwork shed any amount of rainwater or sprinkling action it might encounter through the years. Long story short, we don’t want any water to collect behind our rock features so we all can wait for patches of efflorescence to start appearing to ruin our clients’ good moods. With the planting pockets we include, with any lighting sleeves we prepare, with anything and everything related to drainage, we factor it all into our modeling process from the start and leave nothing to chance. We don’t usually get involved in installing irrigation or lighting, so we carefully coordinate with prime contractors and subcontractors to make certain we’re all accommodating each others’ needs at the earliest points possible. As we see it, a collaborative spirit on the job site is one of the surest ways to build the homeowner’s confidence in the overall progress and performance of the project team. When it comes to finishing and coloring our rockwork, however, there’s no such thing as collaboration with anyone: Like sculpting and painting, these are matters of art and areas where we take complete control. Early in my career, I often brought in colorists to help me in defining the realistic appearance of my projects. By now, I’ve picked up all the tricks I’ve ever observed and confidently guide this critical phase of the process myself. We start by washing all exposed surfaces with a heavily diluted mix of burnt umber and black pigments, thereby aging our rockwork by tens of thousands of years in a matter of minutes. Where we go from there is largely a matter of meeting the client’s expectations – something we fixed in the client’s mind in this case by asking him to find a real-rock sample so we could establish a base color for the finished product and use it as a guide in developing variations and shading in just the right proportions. Making artificial rockwork look ‘natural’ is a two-part process: First, you need to paint and color the surfaces both to align with the client’s expectations and to give the rockwork complex visual texture; second, you need to use plants to soften the edges and give the composition the appearance of having been there forever. Done well, it all seems effortless, but there’s an amazing amount of work that goes into conjuring that impression. Like the model, this sample rock stays on site at all times and comes in very handy in instances where the client might be inclined to change his or her mind and suddenly request a free repainting job. From start to finish, delivering an artificial rock project that aligns with the client’s desires is about controlling masses of variables in ways that make a huge, difficult job move along effortlessly. It takes a good crew and lots of confidence – all in a day’s work!